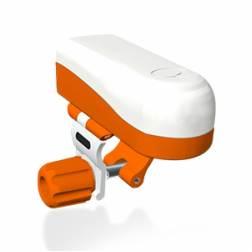 SKYTRAK Launch Monitor a revolutionary development in launch monitor technology. It's a small package with a lot of power. Here are some of the advanced features offered in SKYTRAK. SkyTrak goes where we go. Whether here at the shop or out on the range..
SkyTrak uses high-speed photography to measure the golf ball and provide us with an accurate reading of your ball speed, launch angle, and spin. Golf Perk Club and Lesson Members can use our Flightscope Launch monitor to work on their game. Outdoors the FlightScope Kudu tracks the ball for the entire trajectory in 3D (elevation angles, horizontal angles and velocity) until the ball lands, or as far as the ball is in the radar field of view. Accuracy for carry distance is typically within 2-4 yards at 250 yards and within 1-2 yards at 150 yards. Spin is measured directly and shot shape, which relates to the side spin, is measured directly and not calculated like with launch monitors. SKYPRO A full 360 degree view of your golf swing. SkyPro is a new way to improve your golf swing. It is a small sensor that fits imperceptibly below your grip and monitors your club's motion during a swing. This information is then transmitted wirelessly to a smartphone or tablet, which provides instant feedback on key features of your swing. We believe that feedback is essential for improving your game. Without feedback, you may not know if you're practicing a good habit or just repeating a bad one. SkyPro provides you this information, and makes it as fast, accurate, and easy as possible. Customers will have access to our cutting edge club fitting technology. Our full screen, easy to use iPad applications enable us to test, compare, then evaluate different equipment based on your personal swing characteristics. We can also email you the results of your session enhancing your club fitting experience. The Club Test screen is active while the you test different clubs. Shot data is sent via Bluetooth from the ES12 to our club fitting app where it is recorded. 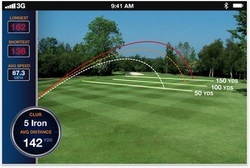 Ball flight and ball direction are manually recorded by simply touching the iPad screen. On screen navigation lets us save, review, or add more club tests. The Session Review screen provides us with a side-by-side comparison of your shot data of up to six different club tests. On screen navigation allows the us to save, edit, view graphs, or email the session to our Golf Perks Lesson Members. From the Session Review screen, the we can choose to graph the session information. The Distance chart provides a bar graph comparing each club test in the session. The Ball Dispersion graph can graph one or all club tests simultaneously to evaluate directional consistency. 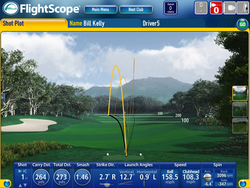 The Ball Flight graph demonstrates the flight patterns one club test at a time. V1 2.0 is the most advanced sport analysis software on the market today. Amateur and professional players of all sports rely on V1 to help analyze and improve their athletic form and technique. With V1 software, comparing your golf swing to your favorite professional has never been easier and more effective to do right from your own computer. Simply capture your swing for self analysis, or send it to a professional golf instructor through the V1 Golf Academy for a thorough swing analysis. Our Swing Speed Radar device,is a microwave Doppler radar velocity sensor that measures the swing speed of golfers. This radar gun is is a true golf instructional aid. Swing Speed Radars assist players in developing/optimizing their swing by providing a convenient measure of their swing velocity as they strive to improve their performance.